Dairy cattle at the Bearden Dairy Research Center. Photos by David Ammon. Bearden Dairy Research Center is an integral unit of research conducted within the Mississippi Agricultural and Forestry Experiment Station. It is also the first stop in the story of MSU cheese. Currently, the dairy milks 100 Holstein heifers, 45 Jersey cows, and 27 crossbred cows every day. The cows are milked twice a day and student workers begin their shift at three o’clock each morning. “We plan everything around the students’ schedule. By milking at 3 a.m., students can finish their shifts, head home, and be ready for 8 a.m. classes,” said Kenneth Graves, who has managed the dairy for more than 15 years. 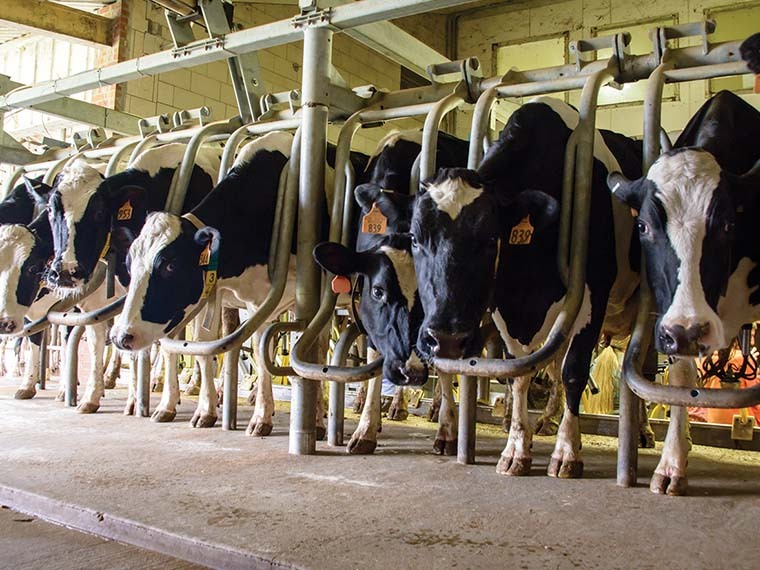 The university’s herd produces more than three million pounds of milk each year. That’s about 369,000 gallons. All the milk goes to the MSU dairy manufacturing facility on campus. From there, it’s used to make ice cream and MSU’s famous cheese plus fluid milk and butter. One of the only university-owned herds to make the top rankings, the American Jersey Cattle Association has ranked the MSU dairy herd in the top 10 for the last several years. The Jersey herd has also been recently ranked in the top 10 in all categories for groups of similar size, ranking No. 5 in protein, No. 4 in milk and No. 10 in milk-fat production. Upgrades over the years have kept up the efficiency of the dairy. In 2007, a double eight parallel parlor with a rapid exit was installed. This upgrade has helped student workers milk more cows faster. Prior to that, the dairy had a double four herringbone parlor, where cows stood at a 45-degree angle, making handling a little more difficult. “We now put eight cows in a space where we used to put four. We do more in fewer steps and we’ve cut milking time down from a process that took four to five hours to something we can now do in less than three,” Graves explained. Cows also receive medical attention during the milking process, and Graves said the updated parlor makes administering medicine easier too. Other updates to the dairy include a new pasture system complete with a center pivot irrigation system. The irrigation system, which will be used to irrigate the grass, will also serve as a way to mist the cows to keep them cool in the hot Mississippi summers. Graves explained the benefits of developing the pasture system. Plenty of pasture-focused research projects began at the dairy this spring. One such project is led by Stephanie Ward, associate professor in the Department of Animal and Dairy Sciences. Her team will test how different levels of protein in pasture-fed cows affect milk production. The Bearden Dairy Research Center sits on more than 1,000 acres. It is located off Turkey Creek Road in the Sessums community of Oktibbeha County.